I’ve written on this site before about allegations of plagiarism in Copycat Images? which included an example from my own work which I know to be simply a coincidence, but a couple of posts on PDNPulse send me back to the subject. Copycat or Not? posted Feb 16 looked at the similarity between landscape images by David Burdeny, a Vancouver-based photographer and earlier work by photographers Sze Tsung Leong and Elger Esser. Leong and his New York gallery owner, Yossi Milo have objected and got their lawyer on the case. This is a feeling that is reinforced by the follow-up post, Copycat or Not, Part II: A Case of Nothing New Under the Sun? where – at least at the small scale we see it on the web, Leong’s four pictures seem to me rather like any tourist snaps (though doubtless on the gallery wall they are considerably larger) while some of Burdeneys have a little more presence. Both photographers work with large format, but to me that doesn’t in itself make their work any more interesting. And, as one of the comments on PDN points out, both have similar backgrounds, having trained in architecture, so perhaps similarities in their work are not surprising. But frankly I don’t find either of their work of particular interest, and when Burdeny is reported by PDN as saying that “the similarities arose because he happened to shoot from some of the same tourist spots” I think it is only too true – and about both their work. I’ve almost certainly got images in my archive rather similar to the two pairs of images of Paris included in the posts, though I doubt if I’d ever want to show either of them, even on the web. There are images you take just because you are there with a camera, and images you take because you have something to say, and on the evidence neither of these guys have grasped this. One of the comments on the second feature points out that you can find very similar pictures to these on a popular stock web site. Burdeney also provides a number of other examples of pairs of very similar works, in some of which I think there is a far clearer case of copying involved, while others are simply coincidental. Whether the actual concept of the show involves copying is also not entirely clear, and in a kind of vague way there would seem little doubt that the Vancouver gallery has tried to produce something in a similar vein to the Milo gallery show. But it would be hard for anyone to claim a copyright on a show of large format somewhat boring images of well known tourist sites around the world – there is far too much prior art. What neither piece tells us is how many works each photographer had in their exhibit and how many of those were of the same places. A pair of photographs is used to suggest a great similarity, but to me fails to do so, as it only includes two pictures from Burdeny’s exhibit which are not particularly similar to those from Leong’s. It does show that both galleries framed the work in white frames and – surprise, surprise – both hung them in straight lines on a white wall. But the two photographers print to different formats and Leongs prints have white borders while Burdeny’s fill the frames. The images seem evidence of a different presentation rather than a copycat show. Another comment points out the similarity of the two artist’s statements, but my problem here is that neither seems to show much originality. However each does includes the identical phrase “each image offers a finely grained density of visual information, rendered in the broad range of tonality made possible by“and while the content is pretty much a cliché of any show of large format work, it seems likely that this exact expression may well have originated with Leong or Yossi Milo. But although I’ve not been able to locate a prior source there may well be one. I find it hard to see that Leong has a case so far as the photographs are concerned. Most of the commenters agree with me, although Leong does have his champions, one of whom writes “his work is not merely about landscape, but has greater conceptual goals. His locations, and the use of very precise form and dimensions, are done with great thought, reason and research.” In which case I have to say he has fooled me completely – or perhaps his conceptual goals have little to do with the actual photographs? It’s also worth looking at the set of pictures, Sacred and Secular on Burdeny’s own website, where you will find that the contested images are probably the least interesting among those shown. Comparing this to the ‘Horizons‘ series on the Yossi Milo site you see a very different show. The case I think is closed. 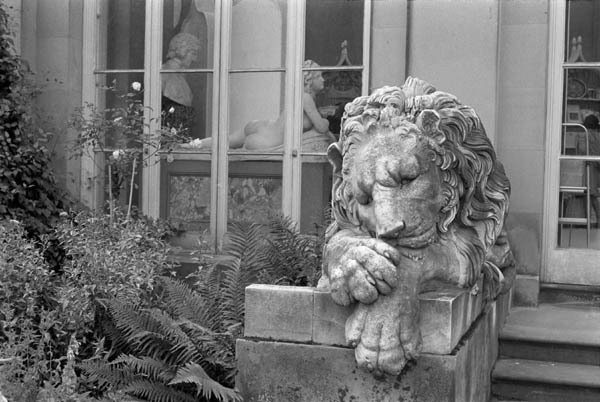 taken by me in 1984 and click on this link to see Fay Godwin’s taken completely independently three years later. More tightly cropped to a square format but otherwise pretty well identical. which I made in 1980 in a way that is perhaps even a little closer to Fay’s picture, taken like hers later in the year so the ferns have grown. And if Edwin Smith or any other photographer walked past there a few years earlier than both of us I’m sure he would have taken a very similar picture. 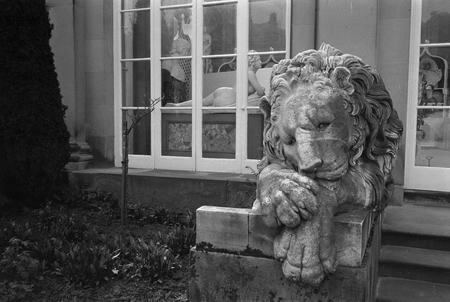 I’m fairly sure that when I took the lion again in 1984 I remembered my earlier photograph and was trying to improve on it (though I don’t think I did – the earlier image is perhaps clearer as a few small images in the interior of the building weaken the later image. I also prefer it to Fay’s as the addition of the male head at the left is I think significant, but others may well prefer hers.) But quite often I have looked at pictures taken elsewhere when I’ve visited the same area after a longer gap of time and have been surprised to see almost identical images. There are some places where there really is little choice of the best viewpoint. This entry was posted on Sunday, February 21st, 2010 at 03:20 pm and is filed under My Own Work, Photo Issues, Photographers. You can follow any responses to this entry through the RSS 2.0 feed. You can leave a response, or trackback from your own site. Though perhaps the only thing it adds for me is the prices of these guys prints, $25,000 for a Leong, while Burdeny is a bargain at $10,500 though personally I wouldn’t go to three figures for either of them. No, make that two.